P4mm indoor soft LED screen board module is specially developed for installations in all kinds of curved, circular and other irregular shapes, requiring clear image details at close viewing distance. 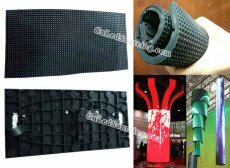 The best price above is based on one soft/flexible module size of 240mm x 120mm with power and signal cables, SMD2121 LED lamps, magnets, and it is not included with control system and power supply. The production time is 15 days.